I’ve always thought the Make-a-Wish foundation was awesome, but combine them with the people of San Francisco and something truly amazing comes together. SF has been made into Gotham City today, with thousands of volunteers joining in to make Miles, a boy with leukemia, Batkid for a day. 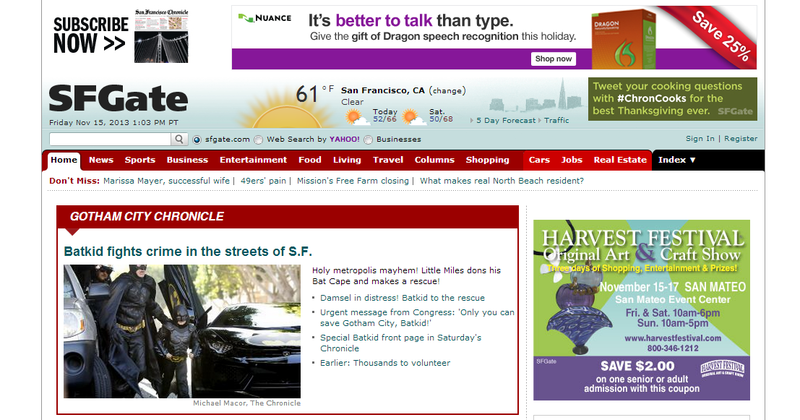 Check out the screenshot of the SF Chronicle’s main website, featuring Gotham City breaking news. And don’t miss the special edition paper the Chronicle printed. Seriously awesome stuff! On another note, I’m moving this site to a new hosting company, so if you follow the blog, please jump over to http://eastbaywriter.com to continue receiving email notices of new posts. 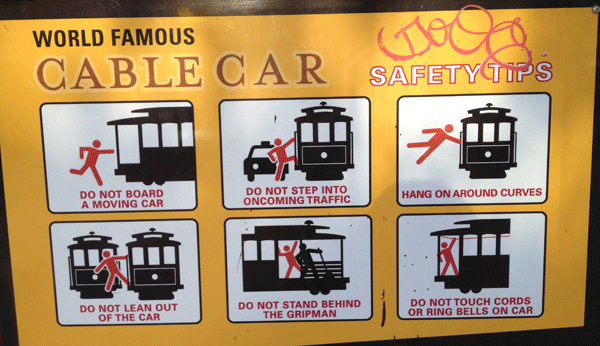 I was on my way to a conference in San Francisco last week when I saw this sign with safety tips for riding the famous cable cars. I imagine the person that designed these images must have had fun using “sign people” so creatively. The “hang on around curves” picture makes me want to go see if I can get that much air, though, so perhaps they missed the mark. It’s also a bit ironic that the “do not step into oncoming traffic” picture assumes said traffic would be in the form of a taxi. If you’ve spent any time in San Francisco, you’ll know it’s next to impossible to get a cab. In any case, next time you come to visit the city by the bay, take heed. That’s a superb title, isn’t it? The title alone made me want to buy Dinty W. Moore’s book, but the Prologue quickly confirmed I’d be glad I did. I am also a regular reader of Brevity’s blog, edited by Moore, and an accompaniment to Brevity magazine, a journal devoted to “the extremely brief (750 words or less) essay form.” All are worth a read. Enjoy the excerpt below from the Prologue of Between Panic & Desire. Deep in the scrub hills of Jefferson County, about eight miles north of Punxsutawney, lay two towns, Panic and Desire, separated by farms, trees, and a narrow road. Returning from Pittsburgh one morning, I tug my steering wheel to the left, swing off the main highway, and motor up a steep rise. I have seen Panic and Desire on a map, and for some reasons I want to visit. Desire comes first, and proves to be little more than a few old houses and a modest cemetery I’m curious how the town got such a name, what it is like to live here, what the people know that I don’t, so I roll my compact car down the main road, looking for someone to ask. But no one is out. The graveyard appears to be my only alternative. I search the ancient stones for clues until a large white dog appears from nowhere. He shows me his teeth, follows me to my car, and barks his sharp warning until I leave. So I head to Panic, a five-minute drive past tumbledown homes and modest trailers – families who have lost their farms, and those who are barely hanging on. Like Desire, Panic turns out to be just a few ragtag family houses along a strip of asphalt. One of the homes has been completely gutted by fire and blackened furniture litters the front lawn. It looks as if it has been this way for months. The man in orange shakes his head, offers a sad shrug, hurries down the road before I can squeeze in another question. I’m intrigued, though, and fairly stubborn. In nearby DuBois there is a library, and I am heading more or less in that direction. Twenty minutes later and I’m in the stacks, unearthing a handful of local history books. For the next two hours I settle in at a wide table and read about the first European settlers – German and Scotch-Irish farmers pushing west across Pennsylvania in the early 1800s. The hills were full of deer, wild turkeys, and wolves. There is no mention of Panic or Desire. I ask the librarian. She doesn’t know either. So I return to my car, but instead of continuing east toward home, I double back, revisiting the road that separates Panic from Desire. At what I approximate to be the halfway point, I pull over, switch off the ignition, and get out one more time into the cold March air. I am in the middle of a small patch of hemlock, a secluded spot, and it is here that I finally realize I don’t want the actual answer, the truth of where these towns found their names. The mystery is sweeter. I just bask in the unknown for a while, alone on the road, halfway between Panic and Desire. Until it occurs to me: I have been here all my life. A few months ago, I attended my first writing group, and I instantly realized that I had no identity. Because I was a newcomer, all the seasoned, confident, group members – many of them published – were asked to introduce themselves, which only some of them did. The group, so accustomed to each other and seemingly unused to newcomers, had a hard time staying on task as the leader prompted each of them to share their names and writing genres. Even before the meeting officially began, the man I sat next to asked me what I write. “Ahhh, … essay, … some memoir,” I responded. My answer sounded more like a question than a statement and I was sure I looked intimidated, unsure of myself. “Do you mean essay, memoir, or memoir essays?” He continued. “Um, … All of the above?” I fumbled for an answer again, the student who thinks the teacher is asking a trick question. Thankfully, he gave me a break, anddescribed the mix of writers’ that attended this particular weekly session. I was silently grateful that the meeting began before I could be further flustered by his polite attempt to match my face to a genre. A what? I thought, but nodded and smiled as though I knew exactly what that was. I really don’t mind if she doesn’t introduce herself. I mentally attempted to head off the awkward conflict. Boy, is she grumpy. I smiled, unfazed by her bitterness – it reminded me of a relative I’m fond of, so I could easily look past it. I’ve always wondered what motivates people to write YA. Maybe now I’ll find out. The introductions continued, and in addition to the YA (Young Adult for those that don’t speak in writers’ code), dystopian (Wikipedia says a dystopia is the idea of a society in a repressive and controlled state, often under the guise of being utopian), and Sci-Fi writers, I learned I was amongst a group that included writers of historical fiction (one WWII novel in progress, another set in the time of the Spanish Conquistadors), Western (which I would soon learn involved drunken cowboys reading their destiny as inscribed on the worms found at the bottoms of bottles of mescal), creative non-fiction, a rather vocal reviewer whose genre I cannot remember, and a poet. Then we got down to business. Various members of the group read from their works in progress, and each had a fifteen-minute time slot for reading and taking comments. As we listened and read along, the rest of us made notes. We corrected grammatical errors, noted misspellings and typos on the printed pages and passed them back to the author at the close of each reading. Spoken comments were kept to major points about things like characters and writing tone. A novelist suggested that a short story be turned into a novel. The poet recommended a prose piece be edited into a poem. Luckily, new members aren’t allowed to read until they’ve attended three sessions. I’m not a very outgoing person, and it took some courage for me to attend the group at all. In fact, I’d been tossing around the idea for three months before I actually went. If I were expected to read, I surely would not have come, and if my attendance represented one step forward, then the unexpected genre identification drove me at least three steps backward. I listened intently to each speaker, though, and felt satisfaction when another member of the group brought up a point I’d also thought of. If I had no identity as a writer, at least I was capable of reading. The comments were all over the board. There were some words of encouragement, but also some blunt criticisms. In all, the readers took their lumps pretty well, though Becky did have to stop an exchange or two when a writer and reviewer disagreed. Periodically, Becky leaned over to whisper to me, providing backstory. Her comments were about logistics – authors weren’t supposed to respond to reviewers’ feedback. They could follow up later, if they really needed to, but fifteen minutes flies by. The group had to be repeatedly rushed along like children unwilling to brush their teeth before bed. She told me it’s always a good idea to bring copies because reading spots open up if scheduled readers don’t show – which happens especially on rainy nights, like that one. Rain or not, I couldn’t see myself reading my work in front of this group. Perhaps my hesitation stems from my introverted character, or maybe from the fact that I’m fairly new to writing. Though I assume the authors probably don’t cling to their genres as tightly as the introductions suggested, each person read or commented with confidence (except perhaps Joan, in her wound-licking state of mind). The investment they had in the pieces they shared was evident, and each clearly had a writers’ identity. I couldn’t imagine emulating their performances with any semblance of grace. I don’t know that I really have a genre. Because I don’t write fiction, perhaps it’s fair to say my genre is non-fiction. If I agree with that statement, though, it sounds as though I’ve made a definitive choice, which I haven’t. And that’s not to mention that like fiction, which runs the gamut from dystopian to romance to just plain literary fiction, non-fiction, too, breaks out into any number of subcategories – memoir, essay, biography, and journalism, to name a few. Examine the category of essay, and the world of identification opens up all over again. Lyrical essay, personal essay, nature essay, travel essay – the list goes on and on. Since I began writing in earnest, not quite a year ago, I’ve simply written about whatever is on my mind. I’ve written a lot about my life, though I have yet to produce more than a couple of finished pieces. Perhaps that means I write memoir. I’ve also written a million papers on leadership as I wrapped up the final year of a Master’s program. That could mean I’m an academic writer. I write articles for my professional blog. In this case, technical writer might be the best label. Then there are the posts for my personal blog, which range from stories about work to short pieces that come from writing prompts. Maybe that means I’m an amateur. Critics of creative non-fiction and memoir say it is weak in comparison to fiction. They believe that only great minds can tackle fiction, so alternatives are seen as inferior, conceivably because we write about what we know, not what we imagine. Sometimes, I almost agree with them. There are moments when it seems an impossible feat to create a world out of words, with imaginary inhabitants, events that shape their lives – offer them pleasure and pain, force them to struggle, but then grow – their personalities emerging slowly on the pages, like a fine piece of glass arrives at the hands and mouth of a master with fire and a blowpipe. Then I think about my writing. I often don’t know where to start, and I rarely know where I’m going before I get there, but I strive no less to provide the rich experience I’m sure a fiction writer aims to deliver. And although I’m not writing fiction right now, I do not preclude myself from doing so at some point. If I do, who knows what genre I might choose? Surely, I don’t. I can’t even say what I’ll write about tomorrow. In truth, I write to figure out what I have to say, and perhaps that’s why I don’t yet have an identity. First, I’ll focus on finding my voice. Perhaps then I’ll be able to tell you what I write.